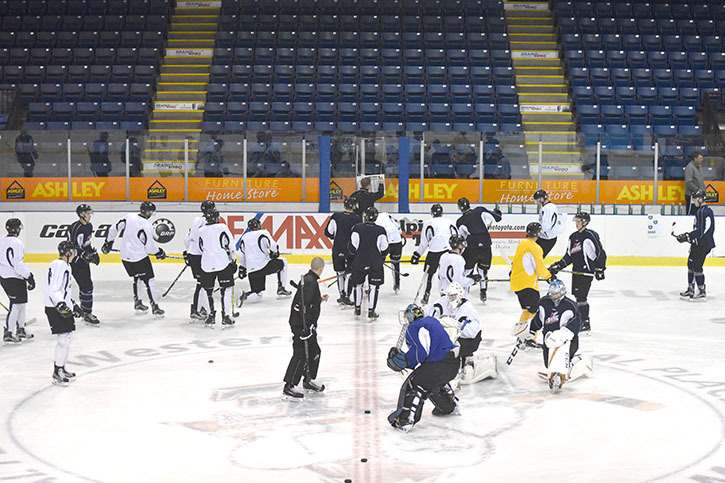 Despite coming off of an extremely disappointing and difficult season, Kootenay Ice President and General Manager Jeff Chynoweth is confident that there are plenty of reasons for fans to get excited about the upcoming season. However, while Chynoweth expects that the team will improve upon their dismal 2015-16 campaign, where the Ice managed only 12 wins and 31 points in 72 games, missing the playoffs for the first time in franchise history, he warns that tempered expectations will be necessary. Chynoweth explained that while he definitely believes and hopes that there will be some immediately noticeable improvements, the team’s focus is more on long-term goals. The Ice’s roster is stacked with young potential that Chynoweth helped bring to the Cranbrook club. The most prominent player in their prospect pool is Peyton Krebs, who led the Ice selected with the first overall pick in the 2016 Bantam Draft. While he lead the team in preseason scoring with three points in only two games, as an underager, Krebs was reassigned to his minor league team last week, and won’t play on the team until next season. The Ice will have rookies to watch though. Although Chynoweth said that he doesn’t expect to have a finalized roster until Thanksgiving, at the earliest, one can certainly imagine that many of the 11 rookies still in the system will stick around and make an impact. Chynoweth isn’t focused on individual names however, and has high expectations for all of his players to succeed and show improvement. “I don’t [like to mention specific players] and put added pressure onto anybody, I’m just hoping that all our players improve,” he said, stressing the importance of the team’s veterans. “We need [our returning players] to improve, if we’re going to have any success during the season. Winning is also helped by good coaching, and Chynoweth is eager to see last year’s rookie hire, Luke Pierce, continue to grow alongside the team. Besides the on-ice product, Chynoweth also expects a lot of other excitement to draw in fans this season. Throughout the year, he said that there would be a number of promotions, with groups like Anti-Bullying and Canadian Mental Health, providing a little something for everyone. When it comes to big events though, Chynoweth said nothing beats opening night at Western Financial Place. As his first season following an absence of postseason play in Cranbrook, Chynoweth seems especially ready to get the new hockey season rolling. Although his expectations are restrained, he clearly sees big things for the team in the future. Now all that remains to be seen is if the players and fans can help turn his vision into reality, and make this year one to remember.